Sugar sweet, slightly earthy smoke. Some smoked ham. Reminds me of sweet stuff. Chewing gum, candy, shower sticks. White mulled wine, vanilla. A really nice fruit note is behind the smoke, but I can not get it apart. Gets milder. Reminds me of warm, somewhat stale, dark wheat beer. Mild, smoky start. Smoked sweets are immediately distributed in the mouth. The fruit is clearer now. Orange, pear, some passion fruit. Marzipan, slightly earthy. The dark wheat beer comes at the end even through. The alcohol keeps itself back. Medium. Smoky sweet, malty, spicy oak, a little bitterness. But oily evidence. Unfortunately a bit too short but a very good whisky. 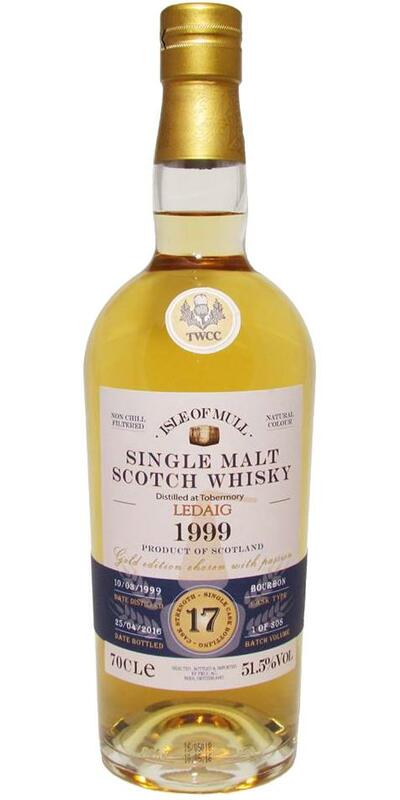 A really good whisky, which proves that Ledaig has many facets to offer even with a little older age. Especially in the current flood of young Ledaigs a successful change. Classic Ledaig smoke rises in the nose. However, this does not cover the wonderful notes of ripe oranges, strawberries, chupa chups and fruit sweets. With a little time, the fruitiness gives way to smoother malt notes and sourdough. Cold ash meets malt beer and bread dough. In addition, I also taste marzipan, almonds and tropical fruits. The alcohol is perfectly integrated. An almost soft leather thing. Unfortunately a bit too short for the great impressions of the nose and the taste. A lot of vanilla, marzipan, some salt, oak and dark fruits remain. This one is dirty! Peaty maltiness with lots of dirty off-notes like stable, manure and some fishy stuff. If you're into this than it's an absolute treat. Hate it or love it. Nonetheless it's well made, properly balanced and full bodied. Good stuff! Peat. Quite farmy like a cow shed. Lemon, white chocolate, orange and a bit of washing-up liquid. Later quite some maltiness that reminds me of dough or even prawn crackers. Peat, orange, white chocolate, malt, herbs and ehhh... spring rolls. Peat, dark chocolate and something perfume-like. Taste: Yes peat, bit metallic. This is high in the alcohol and I think I will refurbish some water. The taste improves with water, but it stays a bit with the standard vanilla, peat, caramel and wood. Finish: Besides ashtray I also notice some vanilla and caramel fudge, clear bourbon barrel influences. Beautiful balanced whisky, in which the smell, body and finish fit together nicely. Character, versatile. Leather, light peat. Slightly smoky too, some roasted meat. And fruity, citrus, lime. And also some sweet, vanilla, honey-like. Leaky peat, some salmiak, bit sharp / peppery. Also some fruity sour, citrus. And again sweet notes, honey. A nice balance between light peat and fruity and sweetness. Alcohol is reasonably present. In the aftertaste the same flavors come back as in the body: Some peppery, peat, little smoke, sweet and citrus. Also a bit dry and he switches to slightly bitter. Again nice in balance.